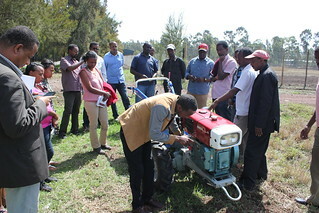 From 1-5 June, farmers from different Africa RISING sites were trained in using small two-wheel multi-purpose tractors as part of an Africa RISING project led by CIMMYT. Bedilu Desta is a farmer from Gudo Beret in Amhara. He was selected by his innovation platform to join the small scale mechanization training in Addis Ababa. He lives with his father and other members of the family producing barley, wheat, beans and sesame on their four hectares of land. They consume most of what they produce. They also have 17 cattle, 34 sheep, 17 goats and 6 horses. However, this number is decreasing because they sell cattle when they need money. If production from their farm was higher, he says , they wouldn’t have been pushed to sell their animals. With five other service providers, he received training on how to operate and maintain the tractor. The good thing about the tractor, he says, is that in addition to ploughing they can be used for seeding, pumping water, threshing wheat, and to transport loads. He says the two wheel tractor will help him save time and energy as it ploughs twice a fast as the traditional system using oxen. In addition, it does seeding and applies fertilizer at the same time. This will help in getting the right proportion of fertilizer for the different seeds and crop types. Tags: africa rising, tractors, USAID. Bookmark the permalink. Dear Ibrahim , thanks a lot for reading our article and showing interest to be part of this work. 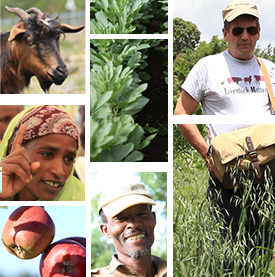 The story talks about the project intervention in Ethiopia with a limited number of farmers under our focus sites. Thus , we are not the right project to respond to your query . However we have Africa RISING project in Tanzania . So I suggest you look in to one of the stories from Tanzania on our website and get in touch with the team in Tanzania . I would like to buy the tractor. How much is it and where can I buy it? I am in Zimbabwe.